You are cracking me up with this stuff! Holy cow, that was fantastically painful to read. I love it. Haha! I was just learning about syllepsis in my Writing and Rhetoric Program. Awesome stuff, it never fails to make me laugh. I have no idea what syllepsis is and wet pants. Not syllepsis but still worthy of mention: "He was a seaman (sic) soaked tissue in the landfill of society." Very nice! Do you know 'Madeira, M'Dear' by Flanders and Swann? Lyrics here. @pj I think the first example is indeed lovely but I find the third to be awkward ("Up her mind" doesn't work for me). However, I think the line, "She lowered her standards by raising her glass" is nothing short of brilliant. What is syllepsis and your point? P.S. -- Feel free to mine my own site for material. 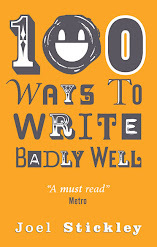 I am sure you will find both many examples of bad writing and it very amusing. She made a dash for the door. Flanders and Swann are, indeed, brilliant. I love this sOoO much. Oh, and hi reddit! 'up her mind' is *supposed* to be awkward. It's syllepsis, it's awkward by deinition - and the added awkwardness of 'up her mind' is a feature, not a bug. Learn about syllepsis, then refuse to stop employing it or your copy editor. You really must write badly well on Twitter if you aren't already. Never let it be said that I don't do what I'm told by strangers on the internet. This blog makes me laugh and the most delightful writing course ever. Steve held the courthouse door, his breath, and onto some sliver of hope as Miranda breezed through. Three months had passed since he'd finally driven her crazy and to the bus station where he'd waved goodbye and all rights to her as his own. I like that Laurie. Laurie's good. the middle sentence has a different verb from the first and last ('made up' vs 'made'). This presumably is deliberately done for the awkward effect, but at the break-neck speed of the recording it took me a few years to realize that this verse really had a matching three-part syllepsis. "made ... up her mind" it has a sort of ogden nash flavor to it and me--istr he was fond of splitting phrasal verbs, though usually to achieve a rhyme, rather than for parallelism. I've been enjoying all your posts, but this one is absolutely brilliant! he'd WAIVED all rights to her as his own. I laughed at this article and all the numerous perversions of the English language here on your epic blog. The computer screen lit my keyboard and my smile, as I avoided my homework and the horror of a world without laughter.